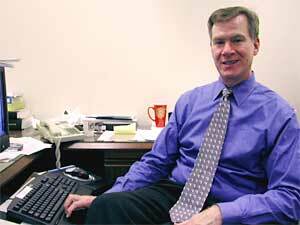 Chris Coleman will be inaugurated Jan. 3, 2006 as St. Paul's 45th mayor. In November, Coleman ousted fellow DFLer Randy Kelly from office with 69 percent of the vote. Coleman's family has deep roots in St. Paul and a strong commitment to public service. Chris's father, Nick Coleman, was Senate majority leader in the mid-1970s. But friends and family say Chris is not part of any political dynasty. They say hard work and a love for the city got him into the mayor's chair. St. Paul, Minn. — Chris Coleman loves St. Paul. He's loved it all of his 44 years. He said so throughout his campaign, and in his election night victory speech at the St. Paul Hotel. "There are no words to describe what it feels like for a St. Paul kid to grow up to be the next mayor-elect of the city of St. Paul," he said. These days Coleman, a former City Council member, and his small staff are setting up his administration from cramped temporary offices in City Hall. As chief executive of the Capitol City, Coleman will be responsible for running all city departments and services, setting a half-billion-dollar budget, and lobbying legislators for state financial support. Coleman inherits a city that has gone through some tough economic times that led to increased fees for homeowners and fewer public safety positions. Coleman says as he begins his four-year term, his top priorities remain those he campaigned on. "I break them down into ... a general priority," he says. "That's really this second shift that we have talked about. How do we make sure that every child in this community succeeds? It is the thing that will make the most significant difference long term in our community." Bringing light rail to University Ave. is also on the top of Coleman's list. He sees it as a major economic development opportunity for the city. "I think we'll have a very clear plan in place for how we will not only do business development along that corridor, add more additional housing in that corridor, how we will make sure that everyone is included in that economic opportunity that exists there," Coleman says. "Whether it's the African-American community, the people who are new to this country, people that have been in the city for generations; I want to make sure that everyone participates in that." Throughout his campaign for mayor, Coleman spoke of providing a seat at the table for all St. Paul residents, regardless of economic, social and racial differences. In that slogan, some hear an echo of Coleman's father, Nick Coleman, an influential DFL state senator. "We will not forget that we as Democrats are committed to the poor and the disadvantaged," the elder Coleman said in a 1979 response to Republican Gov. Al Quie's budget address. "The farmers, the working people, the handicapped and those who need help in finding a decent place to live. We will continue to represent them, and to urge government to respond to their special needs." Nick Coleman died in 1981, just after his 56th birthday, when Chris was 19 years old. Mayor-elect Coleman looks like his dad -- tall and thin, with a ruddy complexion and sandy hair. Chris's older brother, Star Tribune columnist Nick Coleman, says young Chris was very attached to his dad. "He followed my father around from room to room. That was his main role in the family," Nick Coleman says. "My father called him 'Shadow' when he was small, because he was always standing right behind my dad. And if my dad turned around, there was his shadow." Nick Coleman says there must have been some psychological significance to that, because Chris is the only child out of seven who went into politics. Chris says he was always aware of his father's accomplishments. "I think a lot of people assume that he was actually the reason I got into politics. It actually had more to do with Sister Colleen O'Malley, who was a teacher of mine in 6th grade," Chris Coleman says. "I think all kids and all successful adults have someone outside of their parents who really have that belief in that child, and make them aspire to something greater than themselves. For me that was Sister Colleen." The Coleman siblings were also influenced by their Irish immigrant grandmother, Hannah. Hannah used to take Chris, his sister and brothers to the mayor's office in St. Paul City Hall, to instill civic pride and respect for public service into her grandchildren. She even plunked one of Chris's nephews into the mayor's chair many years ago, and said laughingly, that it would be his chair someday. In the 1970s, the Coleman kids rediscovered their Irish roots. Chris learned how to play the bagpipes. His musical talent stayed in the closet for a couple of decades until Coleman saw it as a political asset. In his 2000 campaign for Congress, Chris ran a TV ad featuring him dressed in a kilt and stockings, playing the bagpipe. Coleman's run for Congress wasn't too popular with the DFL Party, in part because he continued his campaign even after state Rep. Betty McCollum won the DFL endorsement. McCollum beat Coleman in the primary. During the 2005 mayoral campaign, Coleman's opponents painted him as a political opportunist, for whom the mayor's race is just another stepping stone. But Coleman's allies say his passion for the job is real. We'll be standing by very proudly, with a lot of affection, and we'll also be there to scold him at the family table if he needs it. DFL State Rep. John Lesch was Coleman's City Council aide in the late 1990s and helped set up Coleman's run for Congress. He says the mayor-elect is earnest, funny and approachable. He says Coleman has good political instincts and he's great to work for. "He treats people equally," says Lesch. "And really expects that if you love St. Paul and if you love the job that you're doing, everyone has their role, but no one's above anyone else. He just would happen to occupy the position of city council member, and now he's mayor, it does not mean he's entitled to any extra benefits." Several members of the current City Council worked with Coleman as a colleague. All but two council members publicly supported Coleman in his mayoral campaign. Council member Dan Bostrom backed Coleman's opponent, Randy Kelly. Despite supporting Kelly, Bostrom says he respects Coleman as a hard worker and a man of integrity. "Over the years, even though we disagreed on stuff from time to time," Bostrom says, "Chris would never tell you one thing and then at zero hour -- when it came to vote on something -- all of the sudden switch and do something else. If he told you he was going to be there, even if things got difficult, he was going to be there. And these are credibility issues that I put a lot of stake in." While Coleman's honeymoon has already begun at City Hall, things are bound to get rocky during his term. City Council members warn of coming budget problems for basic services including public safety, not to mention concern for funding Coleman's priorities like light rail and after-school programs. And Coleman can expect to get an earful now and again from his clan of four brothers, one sister and mother, Bridget. "We love him," columnist Nick Coleman says about brother Chris. "And we also will be watching him carefully, and we'll be on him. Because there's a lot at stake to a family that has this many members, that's been in St. Paul this long, and loves him so much. So we'll be standing by very proudly, with a lot of affection, some tears in our eyes -- there better be bagpipe music -- and we'll also be there to scold him at the family table if he needs it." The lore of Chris Coleman's big Irish family and its roots is woven into his inaugural events. On his first day as mayor, Coleman will open the doors to his office and encourage any kid to sit in the mayor's chair.